I’ve wanted to try my hand at homemade focaccia for as long as I’ve been interested in food. I love bread of every shape, flavor, and color, but focaccia is at the top of that list. Yet I’d put off making it, like too many things, for years. And, having finally done it, I’m here to tell you: It’s easy!! I mean that. And this, coming from someone who is only partially recovered from an irrational fear of yeast. Fortunately for me the #BreakingBread Society, started by some of my favorite bloggers – Shulie of Food Wanderings, Lora of Cake Duchess, and Marnely of Cooking with Books – was just the catalyst I needed. Here’s their mission statement: “Breaking Bread Society was created to inspire you to bake more bread in your kitchen. We want you to bake along with us every month and break bread with your family and friends. We want to spark a bread baking passion across the nation and the world around. We know it’s not an easy task and we are here to help you along the way.” Pretty great, huh? 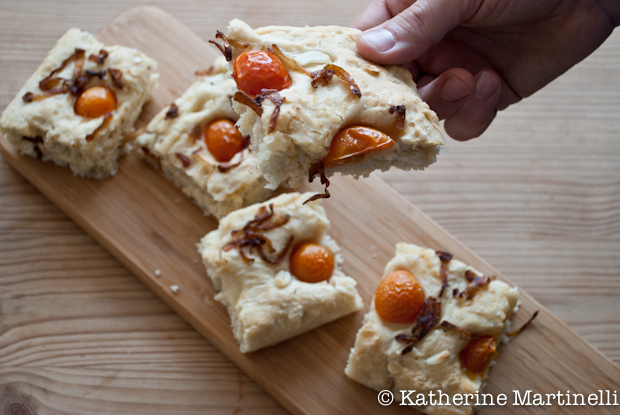 This month the theme was focaccia, and I’m getting in just under the wire! I used the recipe they suggested as a base, from How to Bake by Nick Malgieri. The main change that I made was that I used instant dry yeast instead of active. The two can be used more or less interchangeably, but instant dry yeast (also called fast rising, rapid rise, quick rise, or bread machine yeast) rises faster and can be used in slightly smaller doses (I used 20% less than the original recipe). Also, you can stir instant dry yeast right in with the dry ingredients rather than letting it proof. You can read more about the different types of baking yeast here. The other thing I played with, of course, were the toppings. It wasn’t until after I’d baked up my focaccia that I realized I made an almost identical one to this month’s hostess, Cake Duchess! (Check out hers here.) I must have seen hers and been subconsciously influenced – I mean, how great does it look?! 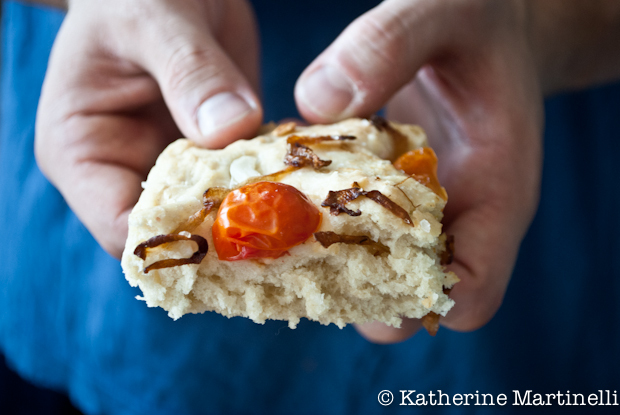 I went with caramelized onions, garlic, and cherry tomatoes – oh my! Seriously, this was some of the best focaccia I’ve eaten. Supremely moist but with a nice crust, and perfectly flavored, I will be making this again and again. I’ve never worked with such an easy dough – you really don’t need to do anything to it. And I loved my topping – the onions crisped just slightly while the garlic and tomato roasted into the bread. Yum!! If you are intimidated by making focaccia or baking your own bread, this is an incredible introductory recipe. It comes together with ease and can be topped with your favorite ingredients. Put the flour, salt, and the instant dry yeast in a large mixing bowl and stir well to combine. Add the warm water and olive oil and incorporate with a wooden spoon. Knead with your hands for 1 minute, until all ingredients are fully incorporated but the dough isn't completely smooth. Cover with a damp kitchen towel and let rise for 45 minutes. Meanwhile, caramelize the onions (this is my quick version). Put the onions in a dry nonstick pan over med-high heat and cook, stirring often, until lightly browned (about 5 minutes). Add the butter, stir until melted and incorporated, and lower the heat. Continue to cook, stirring occasionally, until caramelized (about 10 mins). Generously oil a 9- by 12-inch cookie sheet and spread the dough across it. Cover with a kitchen towel and let it rise for another 30 minutes. Make dimples with yours fingers in the risen dough, and top with the caramelized onions. Lightly put the cloves of garlic and cherry tomato halves into the dough and season with sea salt. Put in the oven and bake for 20 to 25 minutes, until golden on top. Remove from the oven and allow to cool slightly before cutting to serve. Vegetarian To make vegan and parve simply use 1 teaspoon olive oil in place of the butter when caramelizing the onions. Also, I am trying to be more conscious of offering my recipes in US measurements as well as metric - how does it look? Any suggestions? Connect on Twitter; Tweet them at @Breaking_Bread and tag it #BreakingBread! Gosh this bread looks good! Very impressed. Easy, really? I share the same fear with you about the yeast so your encouraging words mean so much! I think we just have fear until we actually try making it. As long as I won’t fail I just need to practice baking. Your focaccia looks amazing Katherine!! Great job with your first focaccia! Your focaccia looks gorgeous! I am one of those who hate yeast, but love yeast-based dishes and love playing with this magical ingredient. Some attempts are so disappointing (I am trying to forget my two recent experiments with challah…). I must try this recipe one day and quickly start being more confident with yeast. Thank you for the encouragement! This sounds fabulous! Love this idea! I love focaccia and this looks so good! I don’t know why but I’m intimidated by yeast breads. I love them but I never make them. Some day I will try it! Oh my gosh just look how doughy it is! I think you’ve got the yeast thing down girl. 🙂 I’d love to join in on the bread making fun!! Must try this!!! Oven on turbo or regular up and down heat? I love focaccia! Great topping choice – I can never resist caramelized onions or tomatoes. Once people get over their fear of yeast they usually find making bread quite fun. I have a fear of candy thermometers-which is probably a good thing! Also liked your quick way of carmelizing onions. Love Italian bread..garlic and cherry tomatoes sound like great toppings. 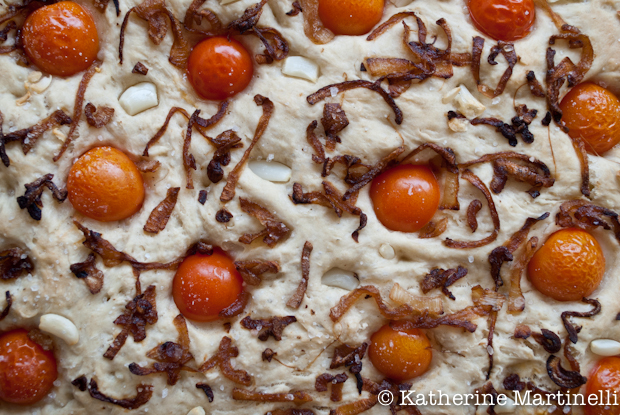 Focaccia is absolutely on my list of foods I love but am afraid to make…you might have inspired me! I love focaccia and it is so easy to make, like you said. I like your discussion of the instant yeast and the differences. So many people don’t know. I don’t share your fear of yeast — I just don’t bake much! I used to bake bread all the time when I was a tad, but rarely do these days. Why? I’m lazy! And I live close to some pretty good bakeries. No excuse, I know. Anyway, your Focaccia looks great. When I do use yeast, I also like to use the instant. I always store it in my freezer so it lasts longer. Good post. Thanks. To repeat you – OH MY! 🙂 10 cloves of garlic AND caramelized onions! Heart be still! What a focaccia! I would definitely make a meal out of this! I love focaccia,this looks tasty ! have a good day Katherine! Focaccia is my favourite bread..love it..your toppings look really yum. Very impressive ! That is one beautiful loaf of focaccia! i love how the tomatoes get all wrinkled and caramelly. The best. I love making/eating focaccia. I’ve never had it w/ tomatoes before, tho. Sounds great. Hey that nice piece of bread gives me such taste satisfaction just by looking at it.. and those caremlised onion,, yummy it is ! Just looking at the photo’s makes me want to run to the kitchen. Wow, that’s a great outcome for the first try, you’re an expert! Dry yeast is the only way to go- much longer shelf life and cheaper too.